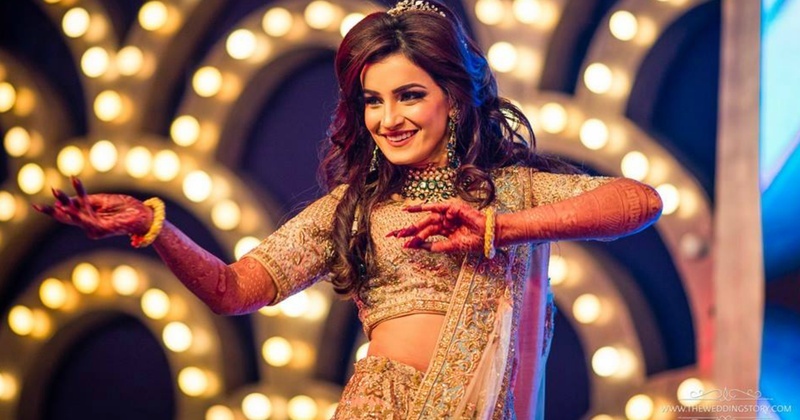 25 New & Rocking Bollywood Songs For Your Sangeet Night! It is impossible to host a big-fat Indian wedding without a power packed sangeet night! Are we right or are we right? A dancing night like that demands a playlist of party numbers and when it comes to sangeet songs, nobody does it better than Bollywood! Luckily there have been quite a few amazing sangeet songs this year and we have compiled a list of just the same. These songs are guaranteed to rock your sangeet night and every pair of feet in the room. This song had to be first on our list having topped all the chartbusters since it’s release. Rope in a choreographer and ask them to incorporate some fast moves too along with the slow traditional ones and wow everyone at your Durbar ;)! How about a little disco-disco with some punjabi tadka? We say it’s a perfect party starter for you and your fiance to take the centre stage and set it on fire! Dil Chori Sada Ho Gaya revamped is the perfect peppy sangeet song for couples who want to their dance their way into their new life! Who can stop oneself from grooving to this number? Among the many things that this film gave us, this song is the ultimate wedding sangeet song which will bring the entire family on the dance floor. All the eating right and working out before the wedding has definitely brought you in shape, hasn't it? So flaunt those latke and jhatkes and twist your kamariya on this super energetic number and have all eyes on you on your sangeet night! Pour your heart out to your man with Main Bani Teri Radha or you can also throw in a surprise performance for your hubby-t0-be with this dance number! Already featured in our Sangeet Playlist, this song has now become a sangeet dance anthem! Rock that Desi Swag with your partner and get the whole crowd swooning. This song will have people putting their snacks down and charging to the dance floor to get into the groove with the entire family. A proper family number, this sangeet song will forgive anyone even if they have two left feet! It’s not just the title but even the lyrics of the song will make everyone go awwwwwww! We just had to include this one! Why? Ever since it’s been released we’ve all been listening to it on loop and it’s impossible to have a sangeet night without it! This song is a perfect number to be played at the big fat desi shaadi. From all the mamas to the buas to the chachis or anyone else downing the patiala peg, this song will be their jam for your sangeet evening! What’s more young and in-love than a gentle spotlight falling on a couple dancing slowly, lost in each other’s eyes, alone in a crowd? This one's for all the dulhas-to-be in the house, to express their love for their bae with an extremely romantic song! Which girl wouldn’t wanna be serenaded in SRK style by her hubby-to-be and be called Zaalima on her sangeet? This one is as romantic as romance can get, by the King Of Romance himself (It’s a catch people!). This old classic in a new package is perfect for a couple’s dhamakedar sangeet performance. So, why not include it in your list of sangeet songs? This song’s catchy tunes are great to get your groove-on and unleash your inner dancing diva! What’s more is that your guests will join in from the audience as well. This remixed version of a rajasthani folk song features some really funky beats and is a must-have sangeet song! With it’s good mix of folksy and modern elements this a great number for your whole squad to dance on. A fast-paced qawwali recreated by Coke Studio has to be on your list of sangeet songs if you are a romantic at heart. It’s the perfect couple slow dance song and if anyone of you has left feet, you’d still be able to sway to this. We would suggest take a few dance lessons to nail this high-energy number which involves a lot of latkas, jhatkas and thumkas. Also, we guarantee your guests would gladly join you on the dance floor and you’ll find this track on-repeat on the DJ’s console throughout the night! Tamma Tamma Again is the 90’s party anthem revamped and it’s even more energetic and fun than the previous number. We give it a perfect 10 as a sangeet song dance pick! Weather you are a punjabi or not, we assure you, everyone at your sangeet will go crazy too when this punjabi wedding song starts playing. With the perfect mix of it’s fun, playful and upbeat tunes, this is one crazy party track. Also, if you’re looking for the ideal sangeet song for a group performance, you’ve got to consider this one! Fun, fabulous and flirty, it’s a great choice for the anyone wanting to get the best of the both worlds - slow dance with a little foot tapping swag! It’s a dance number that can be incorporated into every sangeet playlist. From the flirty lyrics on the French streets to the super fun and lively beats, this one is a great sangeet song pick. It’s also one awesome number to dance on if you have been attending your dance lessons! If you are an adventurous couple, this is the song is totally for your jaanu and you! Don’t miss your dance lessons and nail this one! This one is the late evening jam to remind everyone that slacking off absolutely won’t do because the party has just begun! It would be totally unwise to not to include this awesome sauce number on your sangeet songs list! Put on your dancing shoes and nail your sangeet performance with one of the best Bollywood tracks of 2018!